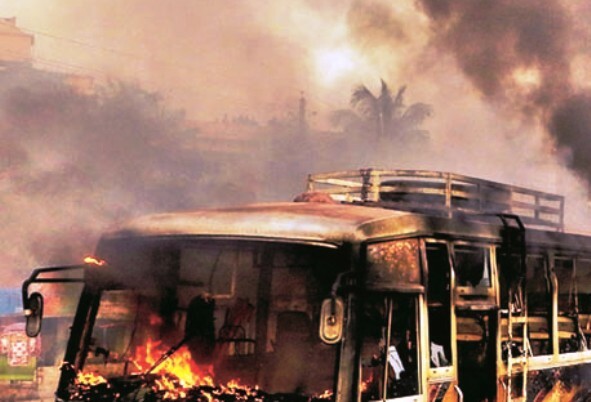 Probashbangla24 online Desk : A fire bomb was hurled at a bus in Bogra hours after the verdict of August 21 grenade attack cases were delivered. The attack, reportedly by BNP-Jamaat men, has left at least 3 people injured. Shahjahanpur Police Station OC, Zia Latiful Islam told reporters that 10 activists of BNP and Jamaat-e-Islami carried out the attack. He said, a long haul bus of Nabil Paribahan was attacked when it was en route to Dhaka around 1:00pm. The police officials said that the bus was vandalized with sticks and torched with a petrol bomb.